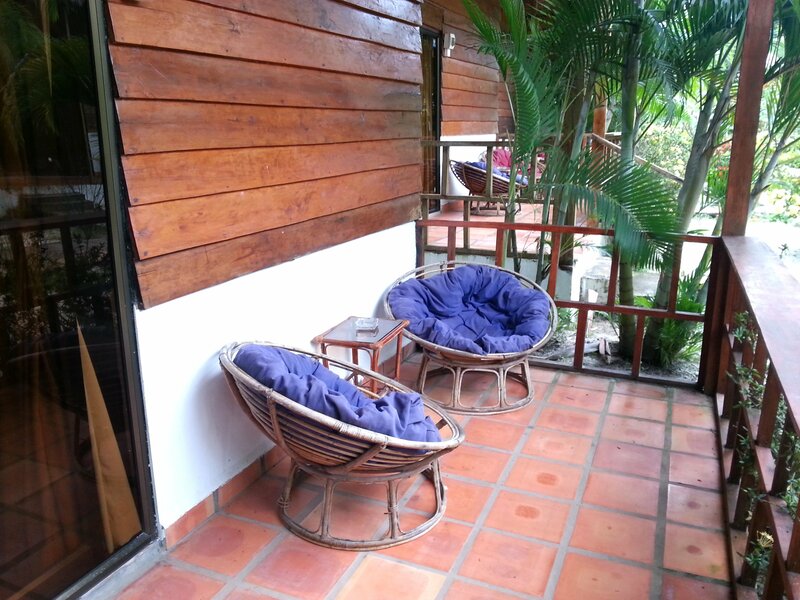 Located 13.4 km from Sihanoukville Railway Station, Otres Lodge is one of the nicer places to stay in Sihanoukville. 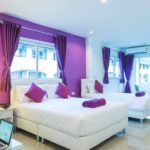 Sihanoukville has been developing very rapidly over the past few years and there are now few affordable beach bungalow style operations on a quiet stretch of beach in Sihanoukville and Otres Lodge is one of them. How long it stays that way is, however, questionable as on the main road behind the beach front hundreds of apartments are under construction for sale to Chinese investors. If you want to visit Otres Beach before it is completely ruined, go soon. The best thing about the Otres Lodge is its relaxed atmosphere. There are 12 bungalows of varying sizes within a garden setting a short distance from one of the quietest (for now) stretches of beach in Sihanoukville. The people who run the resort are laid back and the business owners and taxi operators in this area are also less aggressive than they are in the centre of Sihanoukville. 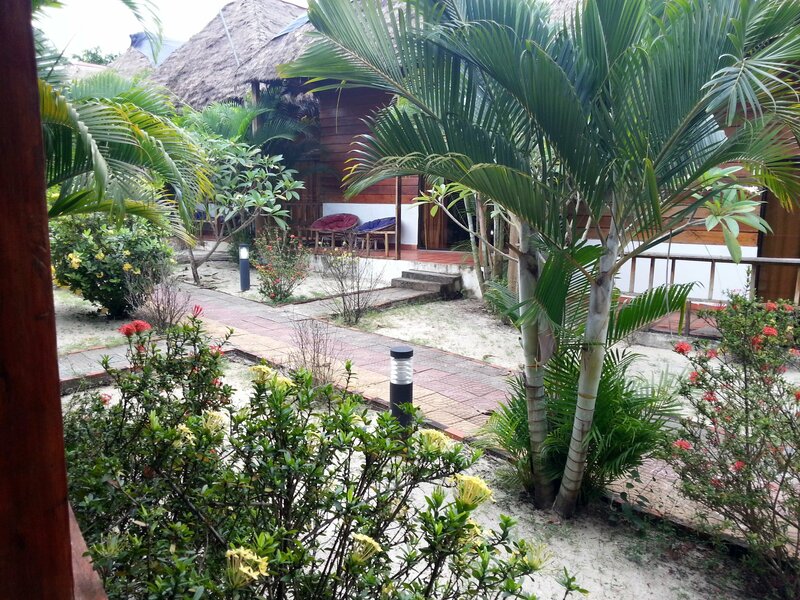 The Otres Lodge is a very short walk from the beach which makes for a relaxed beach holiday. The second thing I liked about the Otres Lodge was the bungalows themselves. They are basic, but they are also large with high ceilings and a veranda with comfortable chairs. Unlike being squashed into a hotel room or 4 metre by 3 metre wooden box, you have plenty of room. You may get the odd insect in the room but that’s normal for the tropics and even more so when you staying outside of town near the beach. 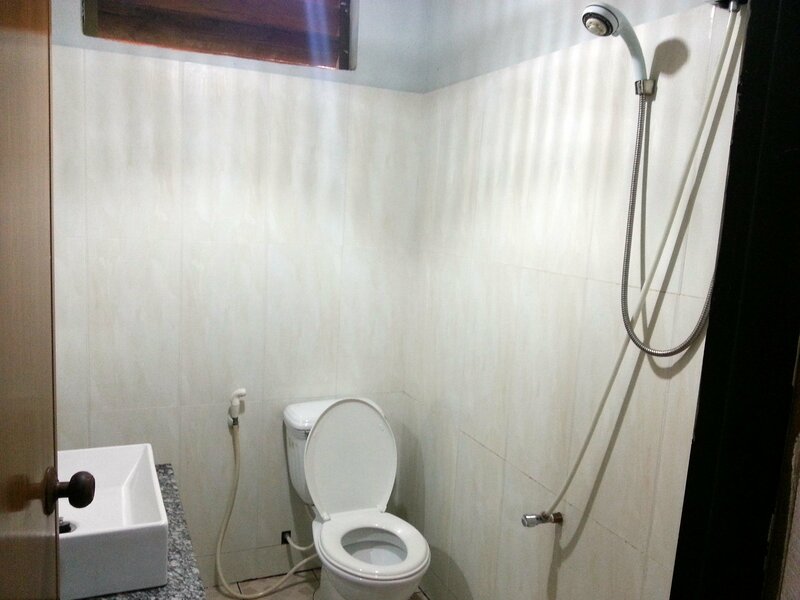 The Otres Lodge is also very cheap. 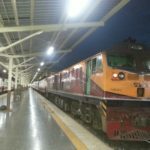 When I went in September 2018 I paid $17 USD a night for a private twin bungalow. In neighbouring Thailand you would be hard pushed to find a similar bungalow near the beach for $17 USD, which is approximately 560 THB. The bungalows at Otres Lodge are basic. The beds are mattresses on built in concrete bases, which were more comfortably than they look in the picture below. The walls and roof are wooden, although the windows and sliding glass doors had fairly good quality aluminium frames. 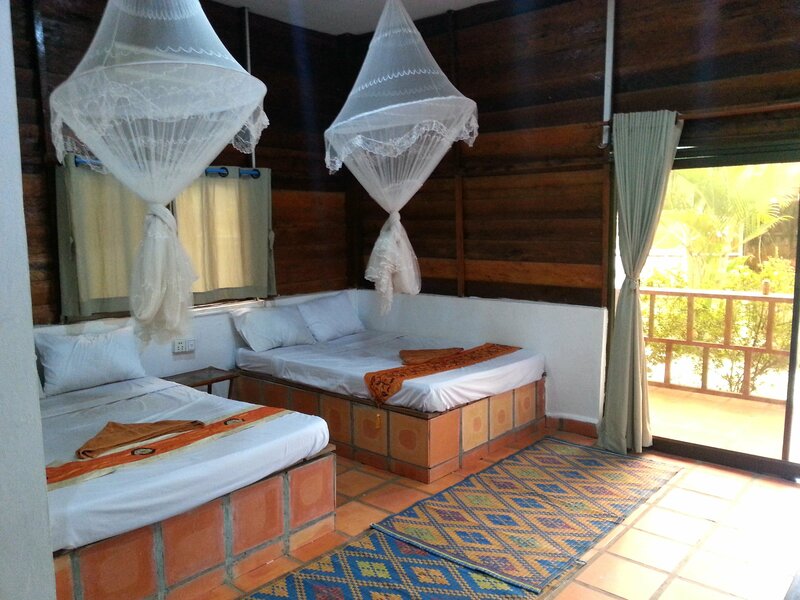 There are mosquito nets over the beds as well. I didn’t use them and I didn’t get bitten. At other times of the year there may be more mosquitoes around. The room had satellite TV, with English language film and news channels, and free WiFi. I didn’t need to use air-conditioning as the fan was quite sufficient to keep the room cool. The bungalows have high ceilings, shade from the garden, and the cooling effect of the nearby sea, which makes them pleasant. The balconies on the front of the bungalows facing out onto the garden are a great feature. It’s nice to be able to sit outside in the shade when you stay at hotel without really leaving your room. The bathrooms were OK. What the resort has done is to build block work boxes in the corner of the bungalows and then tiled them on the inside. Hot water came of the shower and the bathroom as whole was fairly clean. 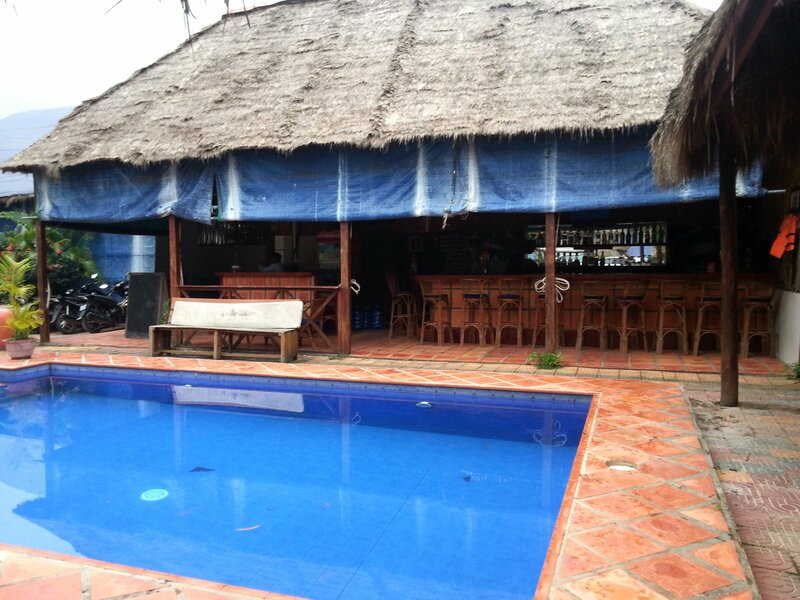 At the front of the Otres Lodge is pool area and covered bar. The bar is fairly cheap: a beer costs $1 USD. If you just want to bring drinks back to yout room then go across the road and buy them from the shop where they cost 30% less. The staff weren’t in the slighted bit bothered about me doing this although I think they may have said something if I had drunk them around the pool. During the high season the Otres Lodge has BBQ nights which I hear are good, although as the restaurant was closed when I went so I can’t judge this for myself. There are plenty of reasonably priced restaurants nearby on the beachfront so you won’t be stuck for somewhere to eat even if the restaurant is closed or the food is not that good.